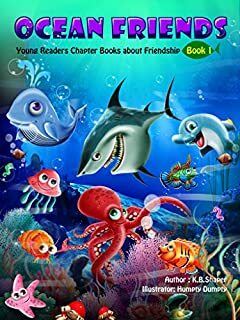 Meet Angel, Mandy, Nestor, Eliot, Sharkie, Ollie and the whole bunch, as they have fun adventures and make new friends in the most unlikely ways. They learn a thing or two about being friends, even when they're different, new, shy, or scared. 1 - In The Black Cloud, Angel and Mandy are exploring when they hear a big BOOM. Soon, it gets very dark and cold under the water. A dark cloud threatens their friends at the reef and a pesky shark keeps trying to eat them. How will Angel and Mandy save the day while making new friends? 2 - New Fish in Town: Danny the dolphin is on patrol. He like to make sure everyone is safe. But a storm threatens the tide pools and a grouchy crab looking for a new shell. And a mean shark is stuck in the sandbar. His best friend Tina the tugboat convinces him to be a friend and save the day. Will Danny be able to save everyone and turn then into friends? 3 - Eliot's New Friend: Eliot is a brown coral crab who loves to play super hero. But regular Eliot is easily scared. When he sees eyes and legs peeking out from under a rock, Eliot is super scared of the monster he discovered. When Eliot and a friend get into danger, who will save them?